One of our goals is to help you learn how to trigger your fat-burning hormones, this gives you the most effective leverage over fat-burning hormones. Your fat-burning hormones work through your live – that’s why it’s so important to do a cleansing program two to four times a year. Your body expends energy (calories) to produce sweat – 1 gram of sweat requires approximately 0.586 calories. 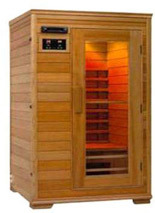 A moderately-conditioned person can easily sweat of 1000 grams or more in one Infrared Sauna session. That’s the equivalent to running 10-15 kms! While this weight loss can be regained by re-hydration with water, the calories expended in the process will not come back. Sweating also allows the body to release built up toxins naturally, keeping your body cleansed even when not on a cleansing program. Because infrared is part of natural sunlight, Infrared Saunas are completely safe! Health professionals have used infrared heat lamps for decades to threat muscle and joint problems. In hospital baby care units, incubators are often equipped with infrared heating systems to keep newborn babies warm.